The St. Lucia government Monday reiterated its position that unless there’s a fundamental change to the operating structure of the cash-strapped regional airline, LIAT, Castries would not be investing financially in the airline. “If St. Lucia’s going to buy shares, it’s going to be buying shares into an entity that we know is free to make whatever commercial decisions must be made,” said Prime Minister Allen Chastanet. “I don’t mind being a shareholder, going to my annual shareholder meeting, and if in fact the management is not doing a good job then you fire the management. I don’t believe governments themselves should be involved in the day-to-day operations of the airline,” he added. The major shareholders of the Antigua-based airline are the governments of Antigua and Barbuda, Barbados, Dominica and St. Vincent and the Grenadines. Last week, St. Vincent and the Grenadines Prime Minister Dr. Ralph Gonsalves said progress had been made regarding the future direction of the regional airline, following a more than four hour meeting in Barbados. The Barbados meeting was held against the move by the shareholders to get Caribbean countries to contribute a total of US$5.4 million in emergency funding need to keep the airline in the sky. At the same time, 11 destinations had been given until March 15, to respond to the airline’s minimal revenue guarantee (MRG) proposals. The Grenada government noting that its economy would be damaged if the airline is allowed to end its operations, has agreed to make a financial contribution to keep the airline functioning. “It is not in our interest to see LIAT go down and we have agreed that we will contribute to a five million US dollar overhead…but it is based on certain factors,” Prime Minister Dr. Keith Mitchell said last week. Initially it had been reported that Grenada, which has 35 LIAT departures per week, would be asked to contribute US$487,113. But Mitchell said the proposals presented to his administration by LIAT is “based on the analysis they have done (and) what Grenada’s contribution would be.”. The St. Kitts-Nevis government says it has appointed a high-level advisory committee to thoroughly consider a number of proposals put forward by LIAT. 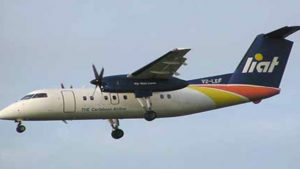 Chastanet, who has long been a critic of the operations of the airline, said that although he knows LIAT is facing difficult times, and has been so for a long time, St. Lucia’s position remains clear. “We’ve not considered purchasing any shares,” Chastanet reiterated, adding that this is what appears to be in practice, and his government is not at this time interested in purchasing shares in LIAT. Chastanet referenced a Caribbean Development Bank study last year that outlined three options for LIAT: shutdown the entity; privatize it, or restructure. He remains sceptical of the restructuring route because it has been attempted many times and he said unless there is going to be fundamental change, it won’t produce different results. Antigua and Barbuda Prime Minister Gaston Browne said that the Barbados-based CDB study concluded that the most expensive option to pursue is to allow LIAT to collapse “because we would have to form a new entity. “That is just more expensive than having a restructuring of LIAT,” Browne said. Prime Minister Chastanet said he believes that the time has come for competition to enter the market. “I think LIAT has been given a free rein in this region for a long enough time, so we can dismiss the idea that its losses are blameable solely on competition. I think it’s time to reintroduce competition into the market,” he said.